Is there any connection between the fashion trend and the camouflage? In fact, dazzle patterns in clothing appeared contemporaneously with the camouflage on ships. Knowing Anno and his steadfast inclination toward Anno-like things, ships feel like the more obvious source of inspiration to me. Nice find, Blockio! Reichu wrote: Knowing Anno and his steadfast inclination toward Anno-like things, ships feel like the more obvious source of inspiration to me. Nice find, Blockio! 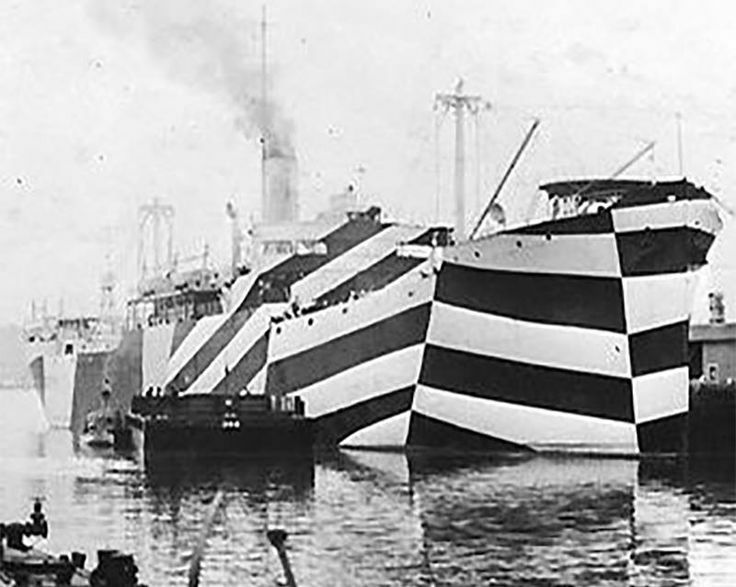 I’ve known about dazzle camo for a while, but I never made the connection with Leliel. Good catch. I wonder why dazzle cam wasn’t more common? It seems pretty effective to me. Determining distance and angle on bow was essential to aiming with torpedoes, and dazzle cam definitely makes that harder, judging from photos. Cybermat47 wrote: I’ve known about dazzle camo for a while, but I never made the connection with Leliel. Good catch. I guess it was a two-edged sword, since it did make it easier to realise that there was something there, even if it was harder to identify. Plus, the camo scheme was unique for each vessel, so it was very tedious to design and apply. At least thats my explanation to it, I dont think anyone has actually bothered with thorough research. Although I do know a few people who might be able to give a more in-depth answer, so Ill just ask them and forward this as soon as I have an answer. So yeah, aparently it just wasnt worth it. I'm curious because some of the Angel's design is very different from eachother. I'm watching the series for the second time and don't remember some of them having such designs. I'm on episode 12 so far. The giant triangle cube, the spider with the acid eye, and then episode 12 is this abstract looking splatter shape with a giant eye. Each of these Angels with a totally unique design. Has anyone read/heard of their inspiration or why the creators chose to make them the way they did? The episode (12) that I just finished really had me wondering. So random looking! There's not much information here AFAIK. I can't think of anything that's been directly stated aside from Anno pointing out that Sandalphon is based on Anomalocaris right on the design sheet. Some guesses can be made about a few of the others, though. - Sachiel: Grows a second face; multiple faces is typical of angels in Ezekiel's writings. Sachi's face looking like a bird skull might reference a cherub specifically (they have four faces, one of which is an eagle's). - Ramiel: Possibly based on the Blue Water from Anno's previous work, Nadia. - Gaghiel: Incorporates elements from various marine animals, like dolphins, rays, and sharks. - Sandalphon: Looks like Cambrian critter Anomalocaris fused with a flatfish. - Matarael & Sahaquiel: Have eyes in weird places or of unusual number. Angels have been described with wings covered in eyes. - Arael: Multiple pairs of wings probably reference the seraphim. - Armisael: Based on a bacterial plasmid. Also alludes to a halo, and possibly also to the fiery wheels on God's throne (ophanim/galgallin). Really interesting stuff. Thanks!! Yeah a few of the designs have surprised me, I guess I remembered the show differently but had some different expectations. Even in the episode (ep 16-ish?) with the black & white patterned ball with the black hole-like shadow was unexpected, initially I was looking for some arms and legs is all! The Angels descriptions on that site is really interesting, I didn't expect they could look that way, makes more sense now. Anno: "When in doubt, sexual imagery." That said Bardiel is also similar to certain types of parasitic fungus that can actually take control of the host's (usually an insect) brain. To add a one more, Shamshel appears to be a planarian with arms stuck on, and its 1.11 Counterpart adds notes of a horseshoe crab with the bony legs. To add a more unifying trend, the mask-like "face" shared by a few of them is probably 1) to symbolise how their true identity is obscured, and 2) to illustrate their inability to communicate with other beings (since it has no mouth). Npgp wrote: I'm curious because some of the Angel's design is very different from eachother. I'm watching the series for the second time and don't remember some of them having such designs. I'm on episode 12 so far. If any of the other psychological terms have any deeper meaning to the show, such as the psychological term A.T. Field being artistically interpreted/literalized by Anno et al in the Evangelion universe as a visible force field, I don't think it's a big leap to see the exaggerated and varied designs of the Angels (including the Lilin, Adam, Lilith, and the hinted at FAR) also as artistic interpretations of various Human aspects/drives/impulses/emotions. As to what aspects would be categorically assigned to each is still a mostly a mystery for me. If I could guess, I'd say Lilith is the Jungian Anima, Adam the Jungian Animus, and the FAR is us, humanity, the audience, Anno, etc. that exist in a universe outside of Evangelion's universe, but can still observe and affect Evangelion. A bit deeper down the rabbit hole is the term Impacts. If you go full biology metaphor, I think they may represent massive points of transition in human development. The first impact being conception in which the SoLs seeded the fertile Earth. The second impact being birth in which Adam is violently pulled/awakened from the Earth. And the third impact being puberty and or the loss of virginity in which the union of two seeds sheds the world of innocence and thrusts them into a new beginning. I would also guess that the piloted Evangelions are a sort of meta wink-wink artistic interpretation of the Neon Genesis Evangelion show as a whole if I were to follow the same logic about the A.T. Field in that the Evangelions (humanoids) and NGE share the same terminology and both act as a sort of in your face gospel (message) for their creators. I think NGE may be Anno's gospel to the audience or, more descriptively, an artistic representation of the Anno's personal journey out of a dark period in his life within the genre of big robot sci-fi where abstract medical, scientific, and spiritual terms are made literal, maybe, in the hopes to better use these terms to help any potential audience member get through their own hardships. It's how I imagine devote people interact with their spiritual beliefs if symbolically interpreted vs literally interpreted. For example, a symbolic interpretation of Genesis would see Adam, Eve, God, the Tree, the Fall, etc. as metaphors in the process of transitioning from child to adult, while a literal interpretation sees Adam, Eve, God, the Tree, the Fall as physically existing in humanity's past. Scrolling through the various interpretations of angels provided by your link was a great help in making my points above. Thank you. Makes me feel for our ancient ancestors and present humanity in our continuous efforts to try and communicate the abstract thoughts, feelings, ideas, etc that construct our consciousness. It's no wonder in the absence of current scientific/medical terminology, other animal species and exaggerated aspects of humanity became such a prominent motif in interpreting the immaterial. Kind of makes me think of NGE as the Bible for the scientific method generation. "A.T. Field" is just a term that was created for the show. There is an ancient rumor that it's a psychology term, but people have gone to great lengths to try to find a single piece of literature that mentions it, and all come up empty-handed. Reichu wrote: "A.T. Field" is just a term that was created for the show. There is an ancient rumor that it's a psychology term, but people have gone to great lengths to try to find a single piece of literature that mentions it, and all come up empty-handed. Ha. Fair enough. Add me to the pile on that one. I blame it on AT Field sharing similar roots to the concept of the Ego and Anno et al's ability in creating delicious psuedoscientific terms. I don't think the loss of AT Field being a term used in our universe/reality but literalized in NGE takes away from the overall idea of the meta-ness of the show. Something I'd like to add is that GNR growing 12 wings may be a reference to the Tree of Life in itself. See, while most people know it for having 10 orbs (especially since the scene includes Unit-01 and the 9 Mass Production Units), it's actually got an 11th that's not always depicted - Da'at, or God itself. In this case, the God in question is a composite of both Adam and Lilith, so it counts as 2 beings, bringing the total number of wings to 12 (1 for each Sephirah and 2 for the Binary Da'at). The idea of a female God also makes reference to the Shekinah, which is the Divine Presence but is also used for refer to the feminine aspect of God. So what's the basis for Shamshel's design? Freudian symbolism? Rei IV wrote: So what's the basis for Shamshel's design? Freudian symbolism? Given the episode focused on Shinji connecting with his masculine classmates It's also interesting that the episode culminated with letting in the other two inside his... Mother. The one bit of Angel design that does have me confused is the Core. On most Angels they're located in the solar plexus, and it seems odd to have their only weak spot exposed like that. Gaghiel had his inside his mouth, and the lineart for Arael makes it look like its core floats in front of it, which is weird. Then there's Iruel, Bardiel and Tabris, whose physiology doesn't make clear where their cores could be, of even if they have them. ACGT-Samael wrote: The one bit of Angel design that does have me confused is the Core. On most Angels they're located in the solar plexus, and it seems odd to have their only weak spot exposed like that. Gaghiel had his inside his mouth, and the lineart for Arael makes it look like its core floats in front of it, which is weird. Then there's Iruel, Bardiel and Tabris, whose physiology doesn't make clear where their cores could be, of even if they have them. Mixing canons here a bit, but in the rebuilds, the angels are classified into categories: Infection, Rejection and a third one that I forgot. Rejection-type angels are ones like Sachiel, Shamshel or Zeruel, with their core exposed on their chest (I know its technically not their chest, but you know what I mean).